Are you asking your account executives to hunt in the dark? 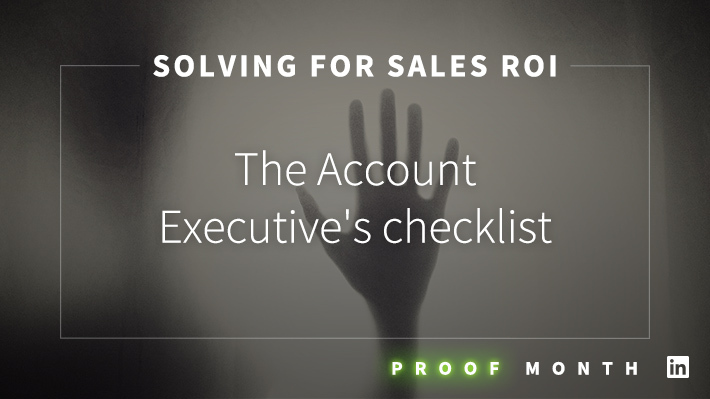 Illuminate their path with this handy sales ROI checklist for account executives. When it comes to closing B2B sales, everyone wants bigger, faster, and more frequent. This pressure falls squarely on the shoulders of account executives, who are sent out into a strange galaxy to hunt new prospects, higher win rates, and stronger sales revenue. It can be an eerie hunt – especially when the path to success is murky at best. To get the best returns, energy cannot be wasted on activities and selling strategies that don’t offer a strong payoff. Account executives need a more straightforward strategy that focuses on proven tactics and high-value engagement with prospective buyers. To help illuminate your hunting path, we’ve put together a sales ROI checklist that gives account executives a smarter process for bagging sales goals. Use this step-by-step approach to prioritize your selling efforts so you can confidently take on the sales activities that are most likely to generate a return on your efforts. Identify the right decision-makers. Speed matters, and time wasted on the wrong prospects means you’re probably missing out on other, more valuable buyers. By using LinkedIn Advanced Search, you can target the right buyers and streamline your sales efforts. Account executives should strive to be the first vendors in line with a given prospect, and efficient prospect targeting is the best way to create those opportunities. Connect with your coworkers to expand your network. A larger network offers more potential connections with the decision-makers you are targeting. Connecting with your coworkers offers a mutual benefit to everyone, growing your respective networks and making it easier to prospect, research and reach out to potential buyers. It also aids in the mapping process, as you work to identify a company’s buying committee and choose which critical players to make your priority. Evaluate each prospect’s LinkedIn profile before making contact. Evaluate each prospect’s LinkedIn profile to get a sense of their needs and pain points. Also pay attention to their activity beyond their profile: By clicking on “View Recent Activity,” you can monitor actions like the content they have shared and the comments they have left elsewhere on the network. This research process is invaluable when trying to better understand the prospect as both a potential buyer and as a person with whom you want to connect. Pay attention to commonalities you share with the buyer that could be used to forge a connection during the early selling process. Engage the buyer via digital channels. Demonstrate an effort to want to know the prospect better: Subscribe to his blog, follow his LinkedIn profile page and his organization’s Company Page. Pay attention to trigger events that could be used as a launchpad for engagement, including job changes, mentions in the news, and recent connections with professionals in your own network. Maintain engagement and visibility throughout the sales process. Leverage insights and tracking metrics to identify beneficial interactions, and to identify instances where attempted engagement or connection fails. Stay active on LinkedIn and other social channels, keeping in mind that your continued visibility will keep you top-of-mind with any and all buyers in the consideration phase. Share content relevant to your interests and specialties and be active in liking and commenting on content. Build yourself into a trusted, valuable asset. Account executives are at their best when the prospects they are targeting see an inherent value in their presence. That means making sure you speak directly to their needs and are able to offer a solution to their problems. Reach out with helpful information, suggestions or other materials, providing valuable content in the appropriate context. By establishing this value and affirming it with each interaction, you make yourself, and the solutions you offer, a more indispensable asset to your prospective buyers. Every account executive is under pressure to produce results. No matter how great you may be at closing the deal, it’s often the prep work of identifying and researching buyers that determines how efficient and effective your selling strategy can be. The next time you’re exploring a buying committee on LinkedIn, use this checklist to set your sights on a clearer a path to success.